4 | TH E M R EP O RT MTECH CSS Implements DocMagic's Total eClose Solution THE SOFTWARE COMBINES COMPLIANCE, ESIGNATURE, ENOTARY, EDELIVERY, AND MORE. T itle and settlement services provider Corporate Settlement Solutions (CSS) has successfully implemented DocMagic's Total eClose solution, according to an announcement from DocMagic, Inc., a provider of fully-compliant loan document preparation, compliance, eSign, and eDelivery solutions. With the integration of the Total eClose solution, CSS can offer a completely new customer experience, gain a competitive advantage, and remain 100-percent compliant with TRID at all times, according to the announcement. "We recognized early on that in order to differentiate ourselves from a crowded marketplace, it was paramount to offer elevated service to our clients," said Jerome Jelinek, CEO and general counsel at CSS. "With the addition of DocMagic's Total eClose, we offer lenders the opportunity to transform their mortgage origination process through the elimination of paper, thereby significantly reducing costs and increasing efficiencies." CSS has created an easy-to-use, out-of-the-box eClosing solution by combining DocMagic's functional - ity, services, and integrations into a single offering. The Total eClose functionality from DocMagic unites eNote, eSignature, eNotary, MERS eRegistration, eDelivery, and eVault services to provide paperless end-to-end eClosings. The integration will also allow for easy and convenient eSigning and eNotarization of documents. "We are excited that CSS is successfully leveraging our Total eClose solution to provide a completely electronic closing process for their customers," said Dominic Iannitti, President and CEO of DocMagic. "As a settle - ment service provider, it is impressive that CSS has taken a leading role in promoting the benefits of eClosings, and as an early adopter, they will enjoy a significant advantage over their competitors." 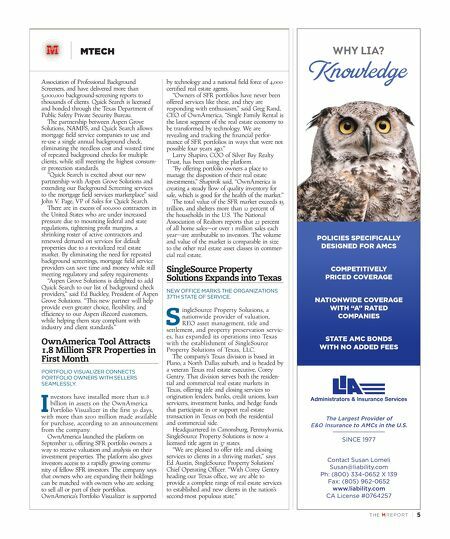 TRID's increased compliance requirements and the pending implementation of the Uniform Closing Dataset (UCD) require - ment have brought the need for fully-electronic transactions to help lenders meet strict timing requirements and recreate compliance checks all throughout the transaction, according to the announcement. DocMagic's system provides electronic proof and evidence of compliant transactions for future audits by including a data and time-stamped audit trail of everyone who has touched the transaction at any level, allowing lenders, originators, and servicers to successfully demonstrate compliance with TRID—a rule that's now been in effect for a year. All eDocuments from the original loan application to the final Closing Disclosure are stored in an eVault, giving lenders and servicers the ability to easily provide proof of compliance. Aspen Grove Solutions and NAMFS Add Background Screening Partner QUICK SEARCH WILL OFFER CUSTOMERS OF BOTH COMPANIES COMPREHENSIVE BACKGROUND CHECK SERVICES. A spen Grove Solutions and the National Association of Mortgage Field Services (NAMFS) recently announced the addition of Quick Search to the industrywide background screening solution Aspen iRecord, according to a recent release from the companies. Quick Search is a family-owned background screening and drug testing provider in North America. 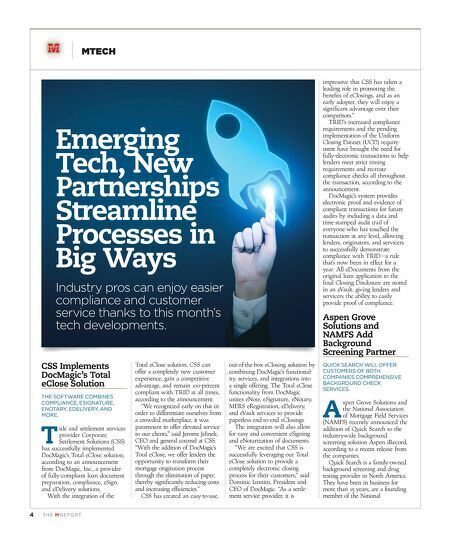 They have been in business for more than 25 years, are a founding member of the National Emerging Tech, New Partnerships Streamline Processes in Big Ways Industry pros can enjoy easier compliance and customer service thanks to this month's tech developments.